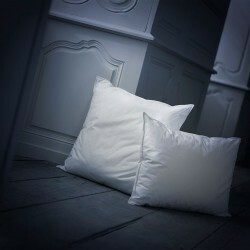 Our firm synthetic pillows are for people sleeping on the back or on the side. They offer a firm and delicate support of the neck and head, all with great delicacy. To know if this pillow is made for you, answer in a few seconds to the short questionnaire "Your ideal pillow", or call us for any advice. For those who want protection against mites, synthetic firm pillows will be able to receive the exclusive GSD® process created by Dumas Paris: a double envelope with an anti-mite and anti-bacterial treated inner lining for maximum anti-allergy protection. Our firm synthetic pillows can be made to measure, on request and embroidered with your initials. The manufacturing time will then be 10 days. All custom and embroidered pillows are not taken back or exchanged.